I did two specific projects in April and it wasn't until June that I considered combining them. 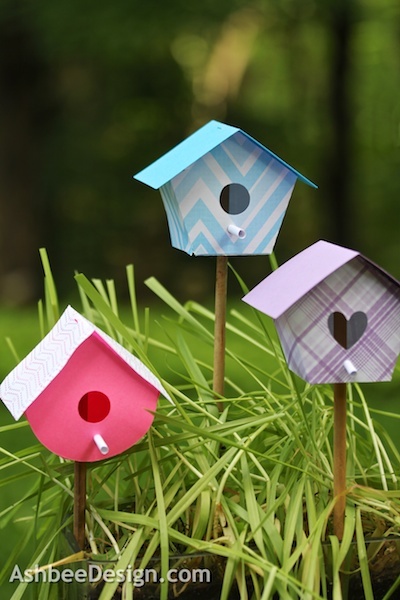 Remember my Silhouette paper birdhouses? I constructed a entire community of them. And then a day later I blogged about my wheat grass centerpiece here. Well yesterday, I combined the two! I was going to discard the wheat grass because it had gotten decidedly funky - kind of like a very bad hair day. But then I was uploading my birdhouse cutting patterns to the Silhouette Online store and I thought, "How about.....?" I took some bamboo sticks from the garden shed, cut little x's in the bottom of the birdhouses, inserted the sticks up through the center and arranged them in the grass. Easy! 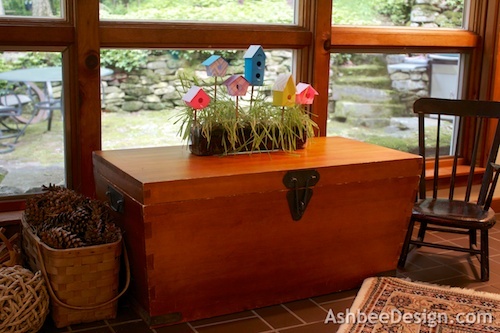 And now I have a new centerpiece adding June like color to my woodbox, which is closed for the summer season! How whimsical. Very lovely summer decor. Yes, they add an easy touch of color to the house! 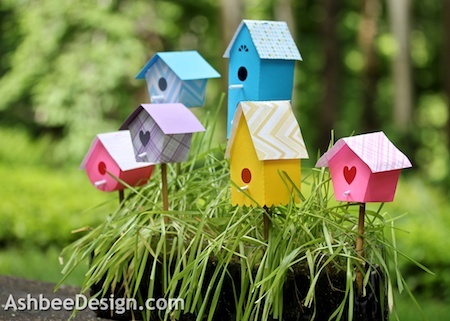 Those little birdhouses are so cute! We'd love it if you would link this post up to our Creative HomeAcre Blog Hop! These are adorable! Pinning these! Thanks, easy to make as well! Thanks! The outside spaces around are home are really what make it special. Click on the "Our House" in the labels area to see a whole lot more, and inspiring ideas as well. Thanks for visiting and commenting. Very sweet, Marji! Great idea combining the two! Get three posts out of two crafts that way - and a new centerpiece as well! Cute! So bright and cheery and colorful! I love this! It's such a great summer addition!